We opened Grand Prix Oklahoma City coverage by running down some of the incredible diversity in the Modern format. One of the big questions entering this event was if the “wild west” state of Modern would continue, or if some of the more traditional decks would rise up to dominate the format. Entering the opening round Sunday, it can be confirmed that Oklahoma remains the wild west. At this point, there can be little doubt that Modern is a deckbuilder’s paradise. 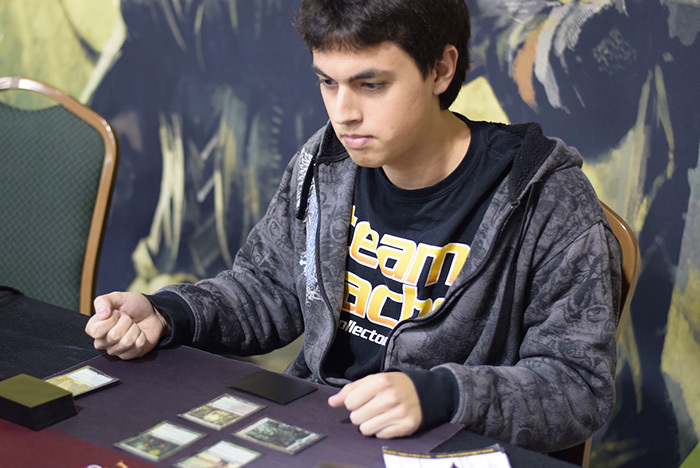 Not only did some of the usual suspects like Patrick Chapin perform well with innovative decks, but he was far from the only player to find success, and not all of them are names you may have expected. Enter Stephen Perigo’s Naya Allies deck. 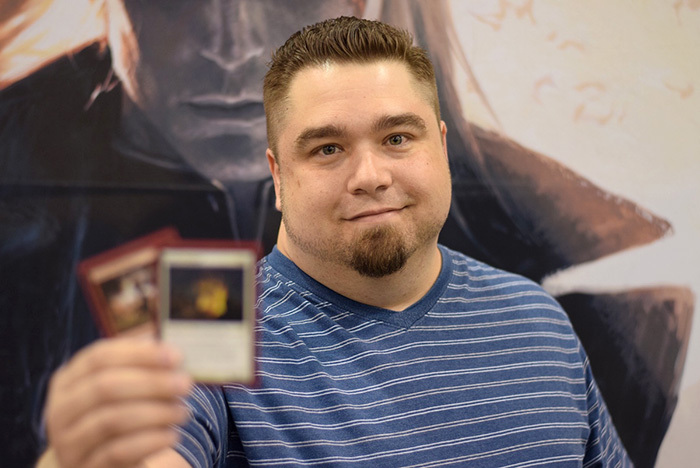 Stephen Perigo began battling for Zendikar a little early, advancing to Day Two of Grand Prix Oklahoma City with his Allies deck. What Perigo has is a unique take on the Modern format. The basis of the deck is one-drop Hada Freeblade and two-drops Kazandu Blademaster, Oran-Rief Survivalist and the most threatening of them all: Akoum Battlesinger. Perigo’s army can generate a ton of triggers from allies entering the battlefield, and it can be blisteringly fast, especially when combined with Hardened Scales or Collected Company. With Battle for Zendikar on the way, Perigo is most excited to add Lantern Scout to his deck, while Munda, Ambush Leader and March From the Tomb will likely find their way somewhere into his 75. While Perigo has the most interesting deck to advance to Sunday, he’s far from the only player finding success going rogue. Of the five decks that went undefeated on the first day of competition, three of them — Lantern Control, Elves and Scapeshift — aren’t decks you typically find near the top of the standings. Further down the of Day Two competitors, the innovation continues. Forty-one different archetypes advanced to Sunday, and no deck comprised more than 14 percent of the field. Those decks included Soul Sisters, Faeries, Ad Nauseam, a unique Jund-colored take on Scapeshift, a slower, Hangarback Walker-focused version of Affinity, and even a wild Return to the Ranks deck. Chris Lopez arrived in Oklahoma accompanied by an army of little green men, and his elvish army carried him to an undefeated record on Saturday. After the success of the Elf deck that won Grand Prix Charlotte in the hands of Michael Malone, the deck fell off the radar somewhat, a development that surprised Lopez. But, armed with Magic Origins additions Dwynen’s Elite and especially Shaman of the Pack, Lopez has one of Magic’s treasured tribes back to the limelight. Chris Lopez has made use of a few key Magic Origins cards to propel Elves back into the spotlight after finishing Day One undefeated. There’s no question that a huge variety of decks can find success in the “wild west” of the Modern metagame. In Oklahoma City, the only question that remains is which of them will be left standing when the dust settles.